Summary: What’s going on behind that fence? A group of kids gets to put on hard hats and take a look at every step of the construction of a skyscraper. Each two-page spread has four lines of rhyming text, supplemented with a few sentences explaining the process. The illustrations have labels to identify machines used, as well as different parts of the structure. A small inset picture gives a macro view of what the building looks like at each step. 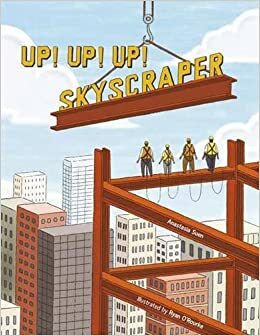 The last page unfolds upward to show the finished skyscraper. 32 pages; ages 3-8. Pros: A fun and accessible introduction to building a skyscraper. Construction enthusiasts will love studying the pictures, while those less familiar with the process will learn a lot. Cons: The fold-out page seemed a little ill-fitting and was already starting to rip a bit when I unfolded it.